Because art makes life worth living — but sometimes public financing programs can be hard to justify. 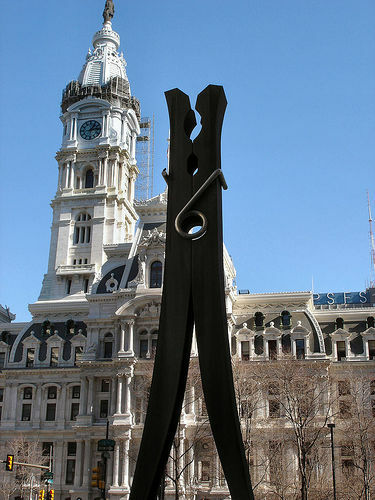 What do a huge clothespin in front of Philadelphia’s city hall, a bean-shaped sculpture in Chicago’s Millennium Park and a series of illuminated sticks soon to be installed in Nashville have in common? They are all pieces of public art and they help to define the image of their respective cities. They also represent a major outlay of public funds. With the onset of the recession, a number of cities and states began to cut public funding for the arts, but as the economy slowly improves, some programs have been reinstated or, in the case of Palo Alto, even started to expand. Where does the money for such public art projects come from — and what do their supporters hope to accomplish? Most public art in the U.S. is funded under Percent for Art legislation, which requires that a small percentage — typically 1 percent — of funds appropriated for the construction of publically financed projects, from courthouses to parks to housing projects, be set aside for the installation of public art alongside those projects. Like many contemporary government programs, the roots of Percent for Art can be traced to the New Deal, when programs like the Public Works Art Project and the Federal Art Project of the Works Progress Administration put hundreds of artists to work. The objective behind the New Deal programs was far more than aesthetic — FDR and the New Dealers were as interested in generating employment for artists as they were in the art itself. This goal became less pressing with the onset of World War II, when the government was focused on overseeing a very different kind of employment. Interest in federally financed public art was revived under the Kennedy administration, which again promoted a Percent for Art program for reasons other than ”art for art’s sake.” In typical Cold War fashion, it believed that such art would embody American ideals of free expression and creativity and offer a clear contrast to the censored artwork of the Soviet Union. Kennedy introduced the Arts in Architecture program, which mandated that 0.5 percent of all federal construction budgets be set aside as an ”arts allowance.” The National Endowment for the Arts (NEA) was in charge of selection, and they, along with federally financed public art, soon hit a wall — quite literally — in the form of Richard Serra’s Tilted Arc (1981) at 26 Federal Plaza in Lower Manhattan. Serra’s massive steel sculpture may have been an outstanding example of Minimalist sculpture, but it turned out that people did not like being forced to “engage” with the piece by having to walk around its enormous bulk to cross the plaza or get to their office building. It was also accused of attracting unwanted company from graffiti artists to rats and terrorists. After a widely publicized and controversial public hearing, the work was dismantled in the middle of the night and carted off to a scrap heap. The episode raised meaningful questions about the role of public art, but it also prompted the NEA to back away from financing projects that had the potential for controversy. However all was not lost in the world of public art. The federal government may have refrained from funding ambitious public art projects, but an increasing number of cities and states adopted them. The first city Percent for Art ordinance was adopted in Philadelphia in 1959 and Baltimore followed suit in 1964. Hawaii became the first state to pass similar legislation in 1967 and the trend continued to spread. The trend even spread to Europe, where Ireland, France and Great Britain passed their own versions of Percent for Art legislation. London-based artist Alex Chinneck’s ”From the Knees of My Nose to the Belly of My Toes” in Margate, England. It’s no coincidence that the first two cities to adopt these ordinances did so when they were undergoing massive urban regeneration and downtown revitalization efforts. In keeping with the Roosevelt and Kennedy administrations, such programs pinned non-artistic hopes on their public art works, believing that they could serve as tourist attractions and signals to potential investors of their city’s economic and cultural vitality. Today, cities’ definitions of ”public art” has expanded well beyond murals and sculptures to include a wide range of projects from building facades, city-wide events and audio tours that encourage people to experience public space in new ways. The value of such efforts is impossible to measure in dollars and cents, making them difficult to justify in times of austerity. But — regardless of the intentions of the leaders who support them — public art invites debate and keeps urban spaces from becoming soulless. For those reasons, programs that fund art for the people generate their own kind of public currency.